cessful Real Estate Investors really expanded me. I then pursued my real estate license,” Marie says, “and that changed the course of my life.” That was twelve years ago, and Marie has had a successful business ever since. “I found out what really set my soul on fire, which is helping as many people as possible have a roof over their heads and experiencing the thrill and excitement of watching my clients reach their real estate goals and home ownership.” Her dedication to her clients has paid off–her community has given Marie Favorite Realtor® Awards and plaques commemorating multi-million dollars in sales. Since the start of her career she has earned Executive, Multiple 100% Club and Platinum awards with REMAX International. Recently she achieved a prestigious, “Hall of Fame” sales status. To date she has accomplished well over $85 million in sales. That’s big numbers working in a small community with a population of 14,000. “I truly, truly love this career! There is no ceiling on growth in this industry,” she says. assisted those affected by wildfires. In her cherished free time, Marie loves to work out at the gym, go for long walks on the beach and spend time with her husband, daughter, son and her three “fur kids.” For the future, Marie will continue her passion in real estate for as long as she’s able and hopes to inspire and assist others on the entrepreneurial journey. contact her via email at realtormcurtis@gmail.com or by phone at 541-661-3056. You can also check her out online at coastaloregon.com. www. Although mentorship is an unpaid endeavor, you’ll be surprised to find out how much you’ll gain from the experience. You’ll also grow as a business person through the process of teaching someone else. It’s also an endeavor that many will pay forward one day, creating a business atmosphere that is based more on mutual success than competition, which is better for everyone. est about your own failures. It can be a huge relief to find out someone they look up to has gone through similar experiences and still managed to come out on top. As we all know, oftentimes the greatest lessons come from failures, which can be times when our character is truly tested. Building trust through mutual respect and honesty will make every aspect of your mentorship more effective. all, you are a reliable support to them and have a complete belief in their abilities. Make sure to always praise their accomplishments. Remember: your job as a mentor is more about guidance than constant feedback. Your goal is to help someone become the best they can be, not someone who just does everything the way you do it. You’re helping them build confidence in their own intuition, which will hopefully lead to a lifetime of success, and one day, they too might be a valuable resource to another mentee down the road. Are You Doing Business As YOU On Facebook? Are you ‘Doing Business As YOU’ on your personal Facebook page? In other words, are you posting your business content from your personal page? Yesterday a REALTOR® asked us, “Why should I bother with a company Facebook page? Can’t I just post everything from my profile page?” The answer lies in what we call division of content. As you may be aware, social media began as just that… social. It was never truly intended for business use. Over time, as businesses began to see the potential in reaching the masses in a new way, they began to intrude on this communication. Today, it is widely accepted that business will be conducted on all social platforms, but the manner in which we do so (and in which we are received) is still a touchy subject at times. We believe it’s important to be transparent on social media. Draw the line between communicating as the Person and the Professional. Not only does this help you keep your content separate and appropriate, it also gives the control to your network of family, friends, colleagues, acquaintances and customers. They get to decide whether to ‘like’ or ‘follow’ your company page. They get to decide whether they want to see your business related posts. User control is the #1 reason you need a business page if you’re conducting business on Facebook. Wouldn’t you rather have a willing and engaged audience over a forced, potentially reluctant one? We have personally eliminated many of the ‘DBA’ offenders from our news feeds and you have likely done the same. As in all controversial social media topics, there is some gray area. And that gray area is often subjective, so consider this post food for thought and decide for yourself. We try our best to keep professional content on our business pages, with a couple of exceptions: 1. Philanthropic Promotion: We’re in favor of posting anything that will help an organization in need on both your personal and business pages. Nonprofits often have little to no marketing budget and rely on all of us to promote their good works, so we believe that’s a good line to cross (as long as it’s about the organization, and not you). 2. Recognition Tagging: Facebook does not allow you to tag an individual on your business page. Yes, there are some tricky work-arounds, but they are inconsistent at best. So when it’s truly important for us to recognize and tag an individual, especially someone who has done something nice for us (inviting us as guests on their radio show or podcast, for instance), we will generally post that on the business page first, then share it from our personal pages, along with a comment recognizing and tagging the individual(s) or business who helped us. Either way (personal or business), remember to be true to the social aspect. Our participation on social media should be about giving, helping, recognizing and connecting…especially when it comes to your business. 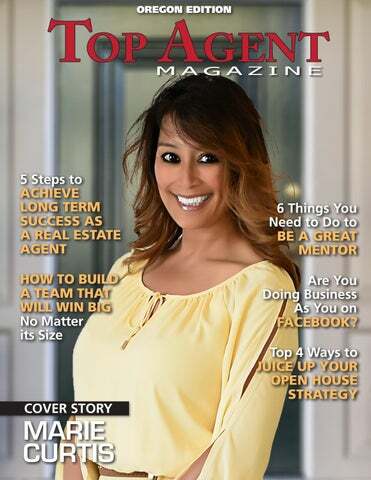 5 Steps to Achieve Long Term Success as a Real Estate Agent Real Estate can have a reputation as an industry with a high turnover as far as agents go. Being a ‘people person’ with an entrepreneurial spirit is a great start, but what some fail to realize when starting out is that this is a business. So if you’re in it for the long haul, you need to treat it that way. Here are some key steps you need to take to have your own successful real estate business. Once you get your license and hang your sign at a Brokerage, you’ll find that you’re pretty much on your own. 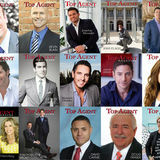 That’s why it’s a good idea for new agents to find a large Brokerage that offers in-house training and mentorship or a boutique brokerage that has more seasoned agents who are eager to take a new agent under their wing. Being able to shadow a more experienced agent is invaluable and allows you to mirror what you’ve seen and run through the numerous scenarios that will arise when you are representing a client. This is a business that is constantly changing, so it’s smart to always stay ahead of the curve when it comes to new technological innovations and systems. There are even numerous online resources, where you can keep up on your trade, such as blogs by top producing agents that are a treasure trove of information. A confident agent with an in-depth knowledge of the business is one that easily earns the trust of their client, leading to repeat and referral business, which will be the bread and butter of your business. Yes, referrals are the basis of your business, but building a strong online presence and marketing yourself to new clients is also important, especially before you’ve built up a strong referral base. Facebook, Snapchat, Instagram, and other social media tools are great way to get leads both for your listings and for yourself. It’s even a good idea to buy several domain names when you start, so that when you’re ready to build a website, you can ensure you have the names you want. Obviously the internet is also a great resource to find leads. Before you find a niche for yourself, it’s important to take advantage of every avenue there is. A lot of successful agents started off doing things no one else wanted to take on like foreclosures, expired listings or lower priced homes. But as you’ll find out, helping those who need it most is a great way to build a loyal client base, that will not only come back to you when they are ready to sell or buy again, but will be your biggest cheerleaders when it comes to referring you to friends and family. One thing you’ll find in this business is that doing a lot of work up top, will lead to a more successful outcome down the road. That goes for marketing plans for your listings, as well as your business as a whole. It might not be the fun part, but it will allow you to one day focus on what you do best, dealing with your clients. Set up your CRM and the other systems you want to use from the get go. Getting these things established before you’re hopefully a busy agent is the best time to really learn them and decide what’s best for you. Once you build a strong foundation and are establishing your client base, it’s important to continually set goals that help you implement your business strategy. You can even invest in a real estate coach if you need someone to hold you accountable. It’s also important to constantly reevaluate what you’re doing. Set up a monthly audit, where you go over what is and what isn’t working. As we mentioned above, this is a fluid business and things are constantly changing, the same can be said of your business. What worked a year ago, might be losing you money as your business grows.